Euro broke the level of 78.6%. The stops on my sell orders opened earlier are already in the black. Most likely, this week the pair will start a serious descending correction (at least). The bears have already reached the level of 38.2% from the previous ascending movement. There is a possibility that the price may continue falling down towards the level of 61.8%. If the bears break this level, the pair will continue moving downwards. Franc is trying to rebound from the level of 78.6%. Most likely, after completing a local correction, the pair will continue moving upwards. We can’t exclude a possibility that the buyers may reach the level of 61.8% within the next several days. 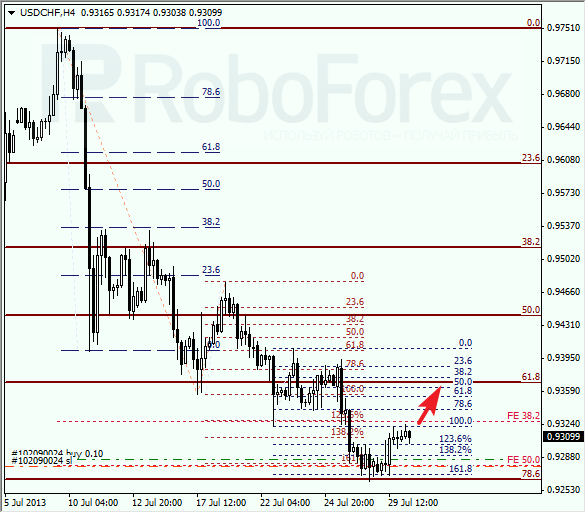 At the H1 chart, we can see that the temporary fibo-zones indicated the exact moment when the price reaches the target levels. The current ascending movement has already reached the level of 38.2% (fibo-correction) and may continue growing up towards the level of 61.8%.